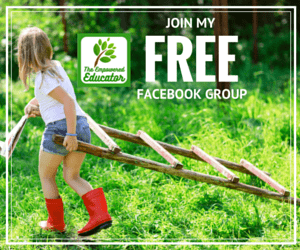 It’s that time of the week again when we all get a chance to find lots of fun ideas in the one place and also share our own favourite activities from the week with the Kid’s Co-Op! We recently received a parcel that also contained this fantastic bit of packaging….think I was more excited with the packaging possibilities than the actual crafting goodies I had ordered! It was simply a cardboard roll with a little bubblewrap around it. 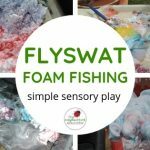 We were all still a little under the weather with the Winter ills on the weekend but the sunshine was glorious so I set up this easy activity on a patch of grass (yes, we do actually have SOME in the yard thank goodness!). I turned over the girls paddling pool to use as a low table (so weary little legs didn’t have to stand!) set out some leftover paint from the day before, a few brushes, a large sheet of cardboard packaging brought home from Daddy’s work and left them to it to explore! 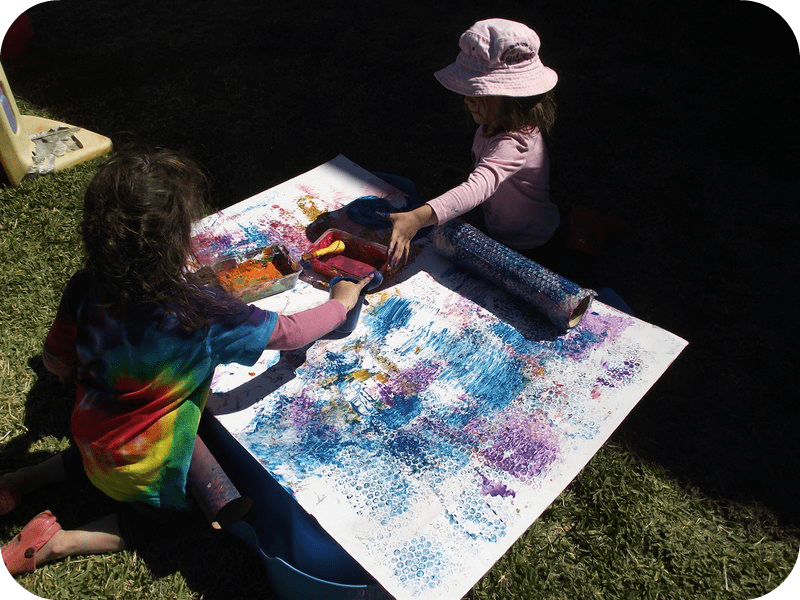 Tara was in painting heaven and couldn’t wait to cover all the bubbles and then get rolling…. There was lots of opportunity for discussion about the beautiful patterns the bubble rollers were making! My sensory sensitive twin Ruby found it harder to get involved in the activity. The wet paint on the bubble wrap proved to be a real challenge for her tactile system and although she did paint a little of the wrap and do a few rolls she soon asked for me to take off the wrap….she just really wanted the cardboard cylinder. 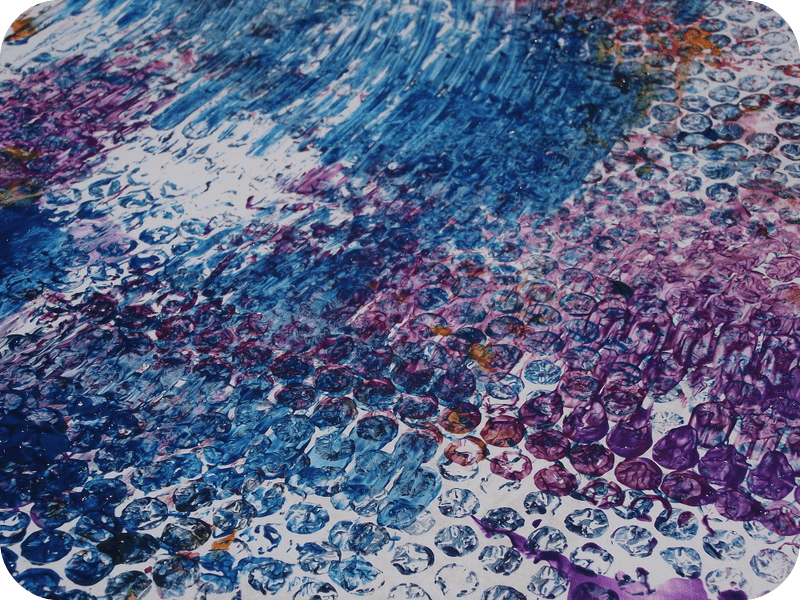 She did enjoy turning the wrap over and flattening it to make a pattern on the cardboard though…this way the paint and bubbles weren’t in contact with her fingers as she smoothed it down. 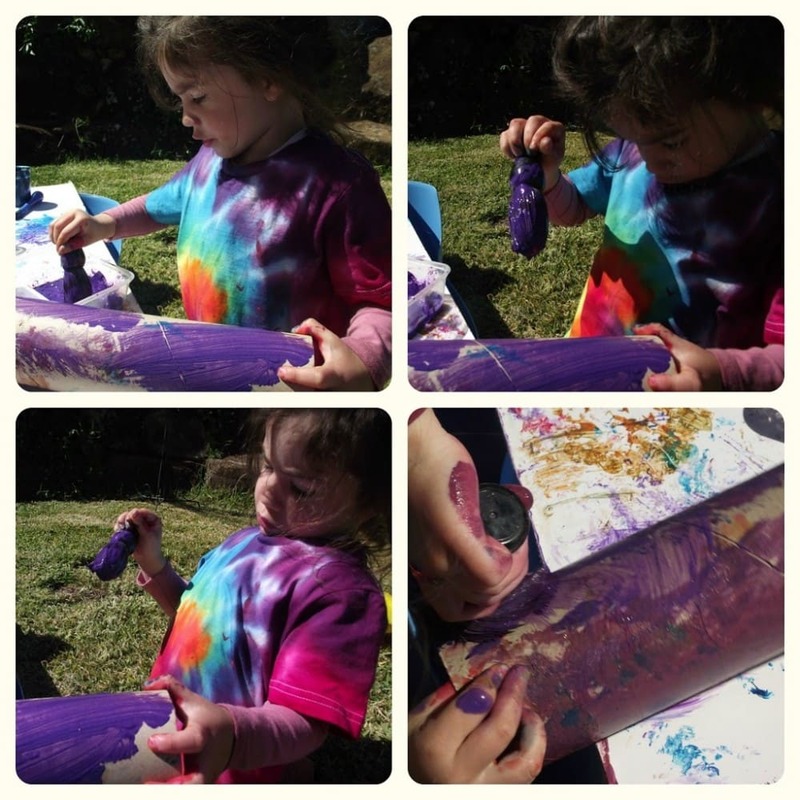 Meanwhile, Tara could not get enough and just kept using the brushes to add more paint and then keep rolling to make different patterns. Kept her so busy which allowed me a little more time to spend with Ruby as she struggled with the sensory inputs. 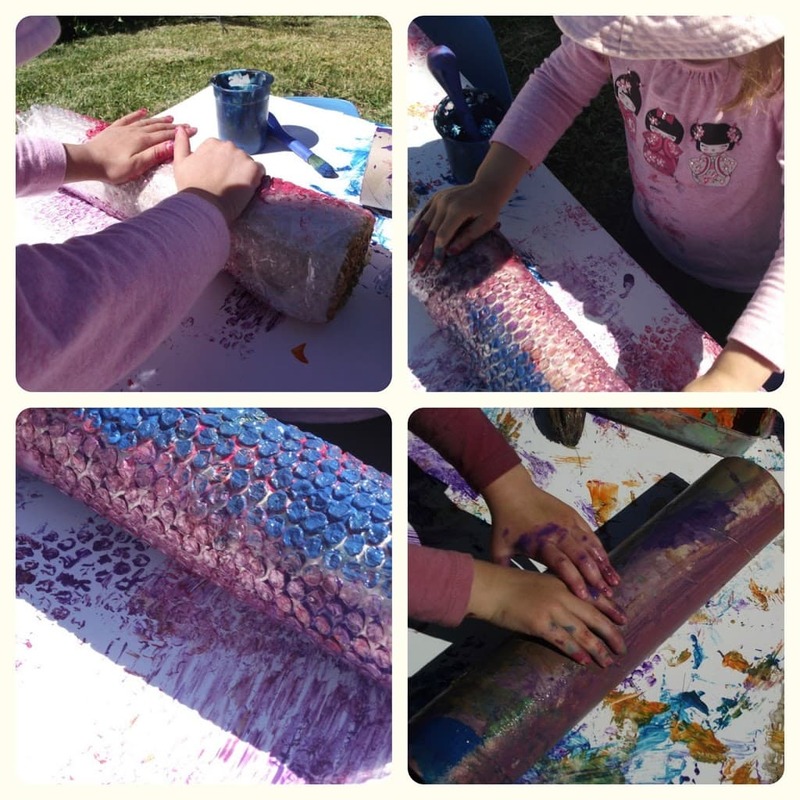 I helped her to pull off the wrap and then she used one of the shaving brushes (which she finds easier with her current grip) to paint her roll. It’s important to challenge our SPD learners but we also need to allow them to direct their own play and feel comfortable about the way they feel is ‘safest’ for them to be engaged. Once that paper was off Ruby was very serious about covering her roll with paint…love how she stood back to check out the job as she went along! She showed me that she could make patterns too without having the bubble wrap on and was so pleased with her efforts! 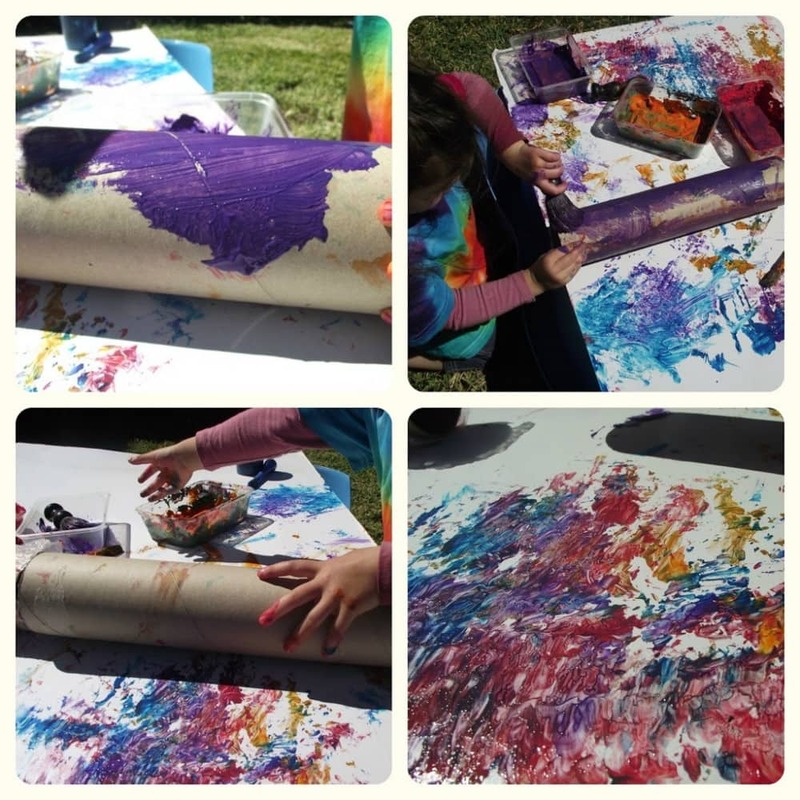 Tara just kept adding more paint and rolling….you’d be surprised how much paint a 3 yr old can use on such a small space! Before using the cylinders I had added some bubblewrap to the ends and taped so that the rolls could be used in a different way. 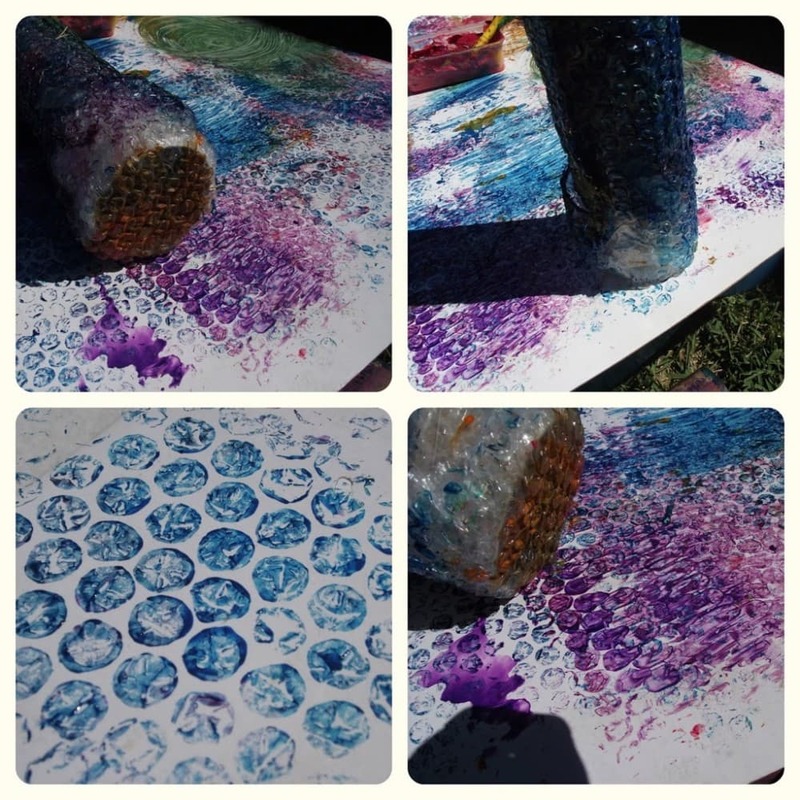 Tara finally discovered this and began stamping all over the place…she was very impressed with the circle prints she made! 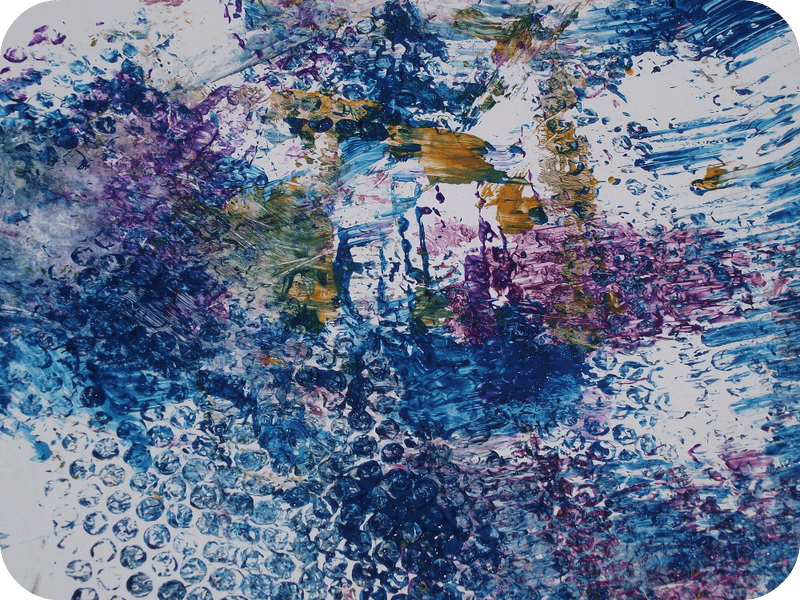 Stamping allowed different hand muscles to be used than when painting with a brush and rolling so it was a lovely extension to the activity. 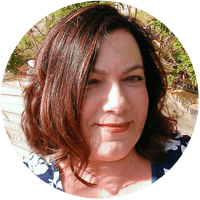 « Weekend Wanderings – Winter Woes and Fairy Garden Magic! What a great idea and I love how you adapted it for your SPD twin. My SPD boy would be in hevean and am sure would be using the bubble wrap covered in paint to rub all over him. Off to pin. I’m off to ask my husband to bring these materials home tomorrow! Fab idea! Cool! I think this could work with doing our own wrapping paper! 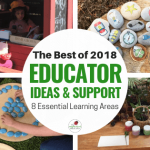 What a great collection of ideas this week and of course you know I love your bubble wrap idea. 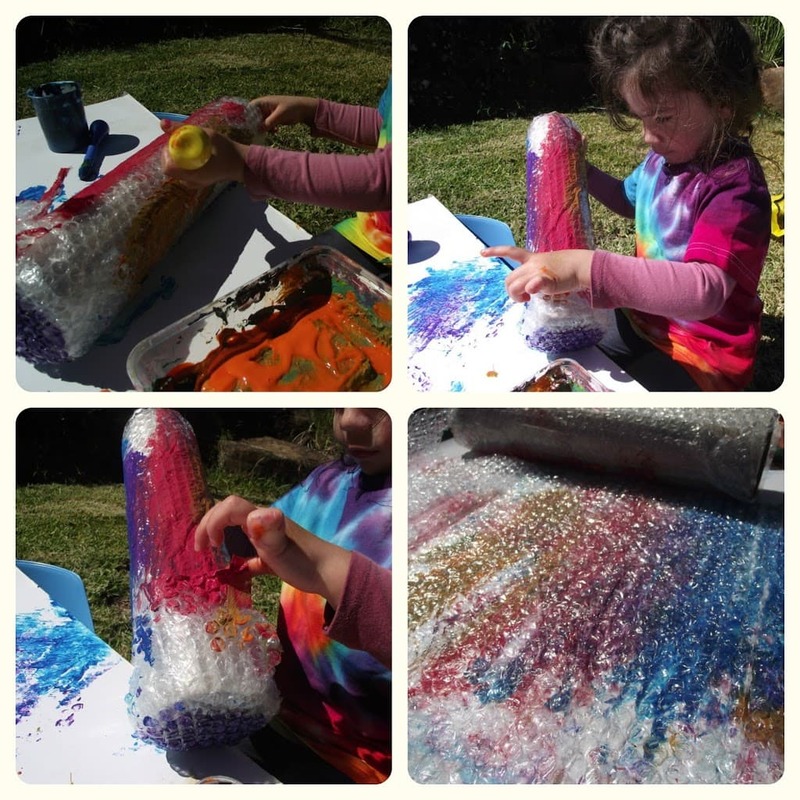 Ooh painting with bubble wrap is so fun, but it’s so lovely to see you following your girl’s lead and letting her explore in the way she feels most comfortable. What lucky kids they are to have you as their mum! 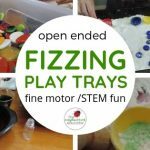 Lots of messy play! And the upside down pit makes a great large table! I hadn’t thought of that. What a great idea! It reminds me a little of the papers Eric Carle makes to use in his books. Love this and have pinned it many times. Great work. I really love the patterns that bubble wrap make… I’ve saved it many times… will have to get it out this week for Miss Daisy to explore! 🙂 And perhaps now that it’s so wonderful outside we’ll follow suit and paint outside so li’l Peppa can join in too! What a fun art idea. 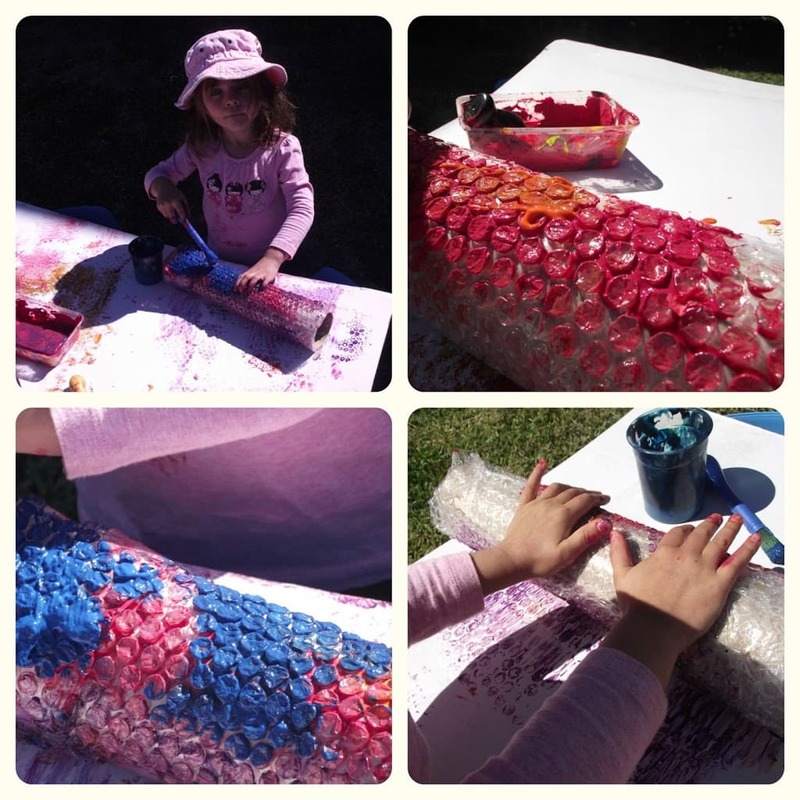 Printing is so much fun for kids, and it worked out well using a cardboard tube roller too. 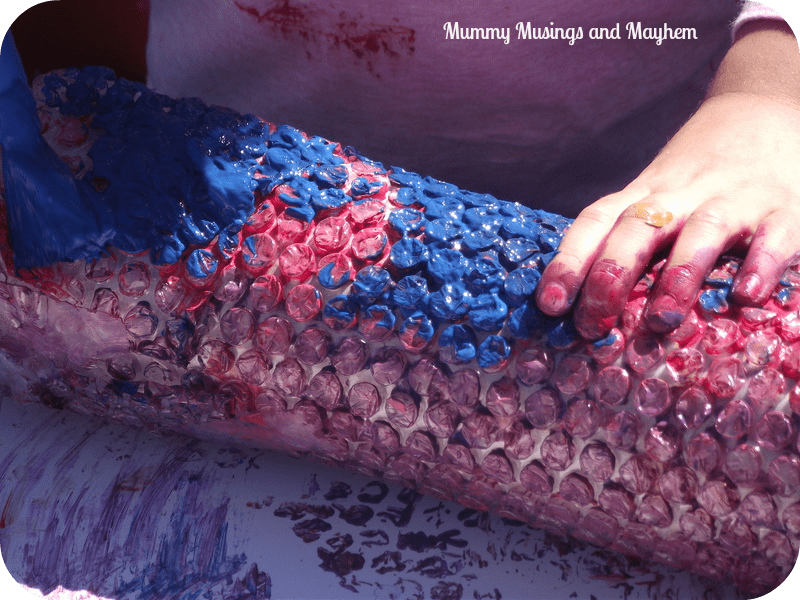 A lovely messy play activity with such simple resources! 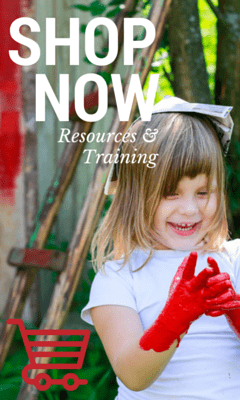 I can see they had a lot of fun exploring and being creative, thanks for sharing with Country Kids. I love finding different uses for packaging material. 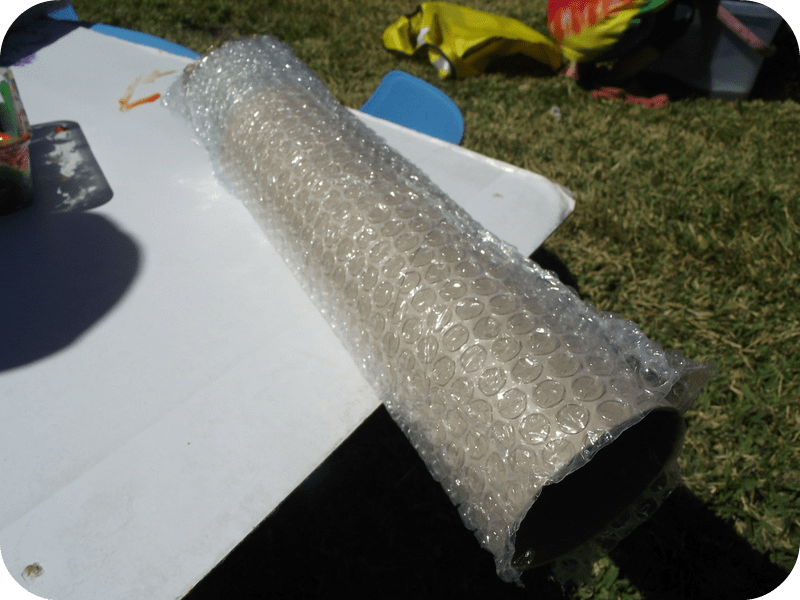 We’ve used bubble wrap for printing but I love your idea of combining it with a tube. Great fun! 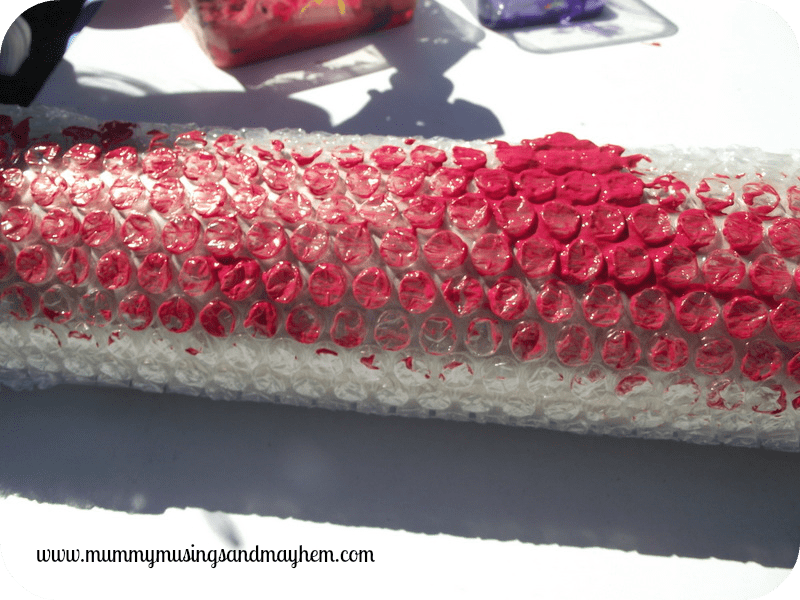 Love bubble wrap! So many possibilities. 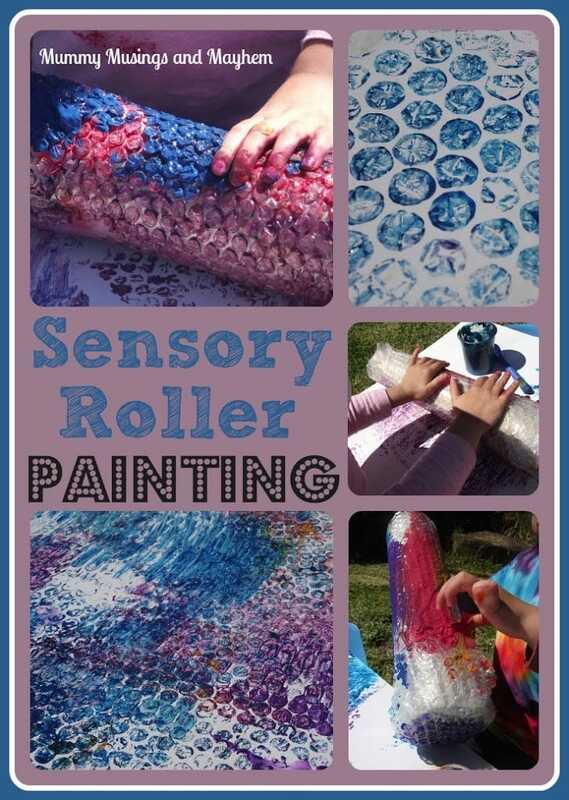 Fab idea to add it to a tube for painting. Awesome fun! 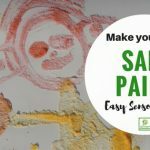 And great tips for kids with SPD. My Pebble isn’t diagnosed with SPD but I think she’s on the spectrum (if there is such a thing! ).